Kumbh Mela, the largest congregation of pilgrims on the planet has secured its place in UNESCO's Intangible Cultural Heritage List. “The Intergovernment Committee for the Safeguarding of the Intangible Cultural Heritage under UNESCO has inscribed ‘Kumbh Mela’ on the Representative List of Intangible Cultural Heritage of Humanity"
The decision was taken during the 12th session of the UNESCO list of intangible cultural heritage committee held at Jeju, South Korea. This inscription is the third in two years after the addition of Yoga and the Parsi festival Nouroz on December 2016. 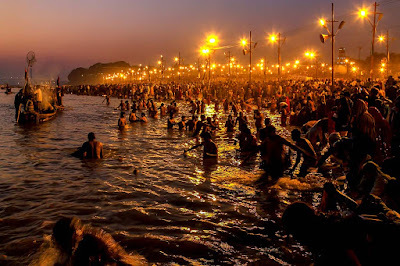 KumbhMela is the 14th intangible cultural heritage from India to be listed in UNESCO’s list. The other 13 in the list are: Chhau dance, Buddhist chanting of Ladakh, Traditional brass and copper craft, Kalbelia folk songs and dances, Sankirtana, Ramlila, Tradition of Vedic chanting, Ramman, Kutiyattam, Mudiyettu. In 2003, the UNESCO General Conference adopted the Convention for the Safeguarding of the Intangible Heritage as an international treaty acknowledging that cultural heritage is more than tangible places, monuments and objects, and that it also encompasses traditions and living expressions.